Russell Westbrook and Kevin Durant are the Brangelina of the NBA. Parsing the divorce of Russell Westbrook and Kevin Durant. Oklahoma City Thunder guard Russell Westbrook shoots a technical foul shot as Golden State Warriors forward Kevin Durant looks on during Thursday’s game. Last Thursday night, Oklahoma City point guard Russell Westbrook—the most sartorially remarkable NBA player since Walt “Clyde” Frazier—walked into Oakland’s Oracle Arena wearing an orange vest emblazoned with the words “official photographer.” It was a strange choice of attire, one that ESPN’s longtime Thunder chronicler Royce Young speculated to be a sly dig against Westbrook’s former teammate Kevin Durant. Durant’s move from Oklahoma City to Golden State, and the resulting breakup of the eight-season Durant–Westbrook partnership, will be at minimum a dominant subplot of the 2016–17 NBA season. Thus far, it’s felt more like the main story, and it’s been an awfully rich one. Throughout the summer and early fall, Westbrook and Durant have behaved like the long-term couple that’s just emerged from a breakup, with each trying a bit too ostentatiously to let the world know he’s “moved on.” Durant and Westbrook have long been the NBA’s Brangelina, leaving hoops junkies to wonder what lay beneath their strange and fascinating cohabitation. Now it’s over, and like with any great tabloid divorce, we’re now left to read the tea leaves of their every movement and utterance. The once notoriously media-averse duo have both recently (and separately) graced the covers and pages of prestigious publications, insisting they were never all that close in the first place: “We had our own cliques that we hung with on the road. Russell had his guys, I had mine,” Durant told Rolling Stone. There have been healthy doses of he-said, he-said: In the same RS cover story Durant claimed that he and Westbrook didn’t communicate during his decision process, whereas the Thunder’s Nick Collison told Sports Illustrated’s Lee Jenkins that Westbrook had gone “above and beyond” in a private Thunder pitch meeting at a Los Angeles steakhouse. Sometimes the sniping has been deliciously oblique: Jenkins’ Westbrook profile intimated that an Instagram photo of cupcakes posted by Westbrook on July 4—the day of Durant’s decision—was in fact a shot at his ex-teammate, “cupcake” being OKC locker-room slang for a soft player. All tawdry rubbernecking aside, the Durant–Westbrook rivalry presents a fascinating microcosm of so many great basketball schisms and debates. Durant was always anointed, picked second in the 2007 draft behind Greg Oden, a decision that 99 percent of hipster NBA fans will now tell you they knew was wrong at the time. Westbrook was picked fourth the following year, one spot ahead of his more-celebrated UCLA teammate Kevin Love, in a move that was widely seen as a curious reach on the part of Thunder general manager Sam Presti. (No one who played at UCLA and was drafted in the high lottery seems has done a more impressive job than Russell Westbrook at internalizing the notion that he is an underdog.) Personality-wise, Durant presents a steady, almost Sphinx-like demeanor on the court, while Westbrook is all heart on sleeve, possessor of one of the league’s most expressive faces. 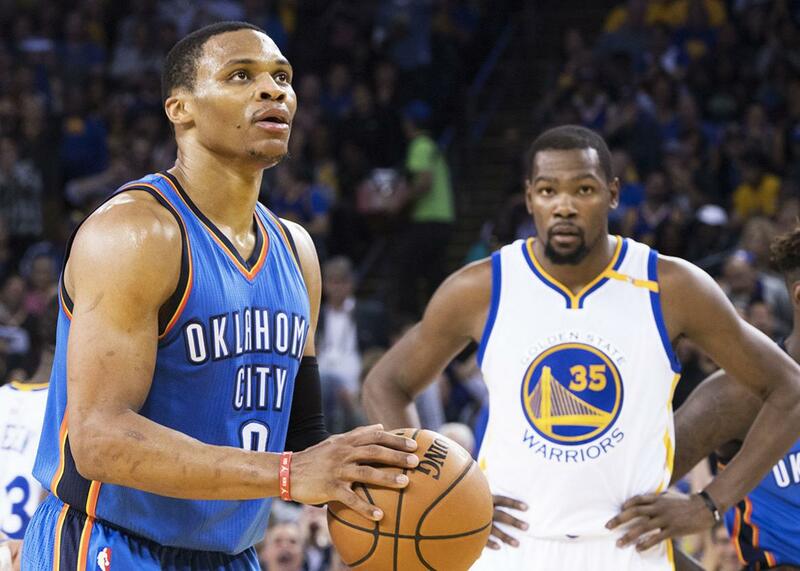 Nothing about Durant is volatile; nothing about Westbrook is anything else. Durant is pure hoops, a spindly and graceful player who glides around the court stroking his gorgeous jumper as though there is nowhere else on earth he ought to be. I would pay to watch Kevin Durant shoot baskets in an empty gymnasium. Westbrook is a sensational athlete whose ungodly strength and leaping ability allow him to play anywhere from four to six inches taller than he actually is. (Westbrook, 6-foot-3, last year averaged as many rebounds per game as Brooklyn 7-footer Brook Lopez.) His jump shot is a perpetual work-in-progress, a haphazard afterthought to his kamikaze, barrel-into-the-lane style. Kevin Durant makes basketball look easy. Russell Westbrook makes it look impossibly difficult for himself and everyone in his way. The rivalry breaks down along one of the fundamental dichotomies of sports, grace versus force, but also along the lines of competing theories of basketball. Durant’s move to the Warriors seemed craven to some, but it was the ultimate validation of basketball as a team game. More than any other NBA team, the Warriors—a squad defined by fluid and relentless movement and deft and selfless passing—exemplify a whole-greater-than-sum-of-the-parts ideal. This has never been Westbrook’s style of play. As I wrote last May, Westbrook is an unreconstructed devotee of the style known as “hero ball,” the fervid conviction that one great player, with the appropriate excesses of talent and will, can drag his team to victory. One of the great contradictions of NBA fandom is that we want to believe that team ball is more worthy than hero ball, but we’re thrilled when the latter wins out. The NBA, after all, is an exceptionally personality-driven world. Its players are more exposed, physically and otherwise, than the stars of any other sports league, and a single great player really can alter the axis of the sport entirely. Look no further than last June, when the Warriors won 73 games and lost in one of the most memorable NBA Finals of all time to a lesser team that just happened to have the world’s best player, a guy who did incomprehensible things in the face of a squad that wasn’t supposed to lose, penning one of sports’ all-time great personal redemption stories in the process. Thus far the Durant and Westbrook separation has been great for gossip, great for narrative, and mostly great for basketball, at least on an individual level. On Thursday night, Durant put up a scorching 39 points in 31 minutes in a performance that felt distinctly wrathful, and he’s currently averaging 30 points per game, dispelling the notion that playing alongside Steph Curry and Klay Thompson would cause his numbers to dip. For his part, Westbrook opened the season as the favorite to win the NBA’s MVP trophy, and if he keeps doing what he’s doing—he is averaging close to a triple-double, and the 5–1 Thunder are thus far exceeding expectations—he most likely will. After an offseason of gossipy innuendo and glossy-page backbiting, we’re finally being reminded of why we care so much about these guys in the first place, and damned if it doesn’t make those cupcakes all the more delicious.